As a Hana Road tour company we believe we must do everything possible to be Eco Friendly. We don’t think we have done everything we can, but we hope to be more and continue to be one of the few Maui Eco Tours. Here is a small list of things we do to be Eco Friendly. We recycle all our Soda, Juice Cans and empty plastic water bottles; we donate the money from these efforts to local Canoe Clubs or select Senior centers in Hana. We recycle as much waste as we can; we leave no rubbish On the Road to Hana Tour and provide trash containers on our vans so nothing is left in the Rain Forest. We also purchase products made from recycled plastics and glass and donate them to various organizations to use. Our Tour Van Maintenance Program has been a Model for many transportation companies; we exceed the Vehicle Manufactures Maintenance Requirements. Our used fluids are recoveredand sent to be recycled. Following these procedures keeps our vehicle emissions as low as possible. We maintain our vehicle tire pressures properly to increase tire life and increase our fuel mileage. We use the water from the melted Ice in our coolers to irrigate the Plants and trees on our base yard. We have plans to install wind and solar power generators to subsidize our electricity. This turns out to be more costly than just paying for electricity from the power company, but it is a small part in lowering the demand for fossil fuels and polluting our environment. The fluids we use to wash our vans are all environmentally safe, not just biodegradable. We are in the process of using a Plastic/Fiber custom made table cloths which will eliminate the need to use the linen wash companies, this again keeps the need for electric consumption low and eliminates the need for harsh chemical agents used to clean the linen. We use real Silverware and Glass Plates instead of Plastic and paper products, this keeps down the waste in our landfills. The dishwasher uses cleaners approved by the Health Department and is Environmentally safe. 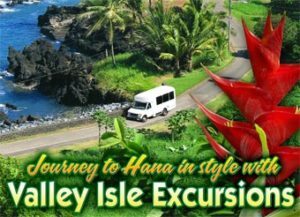 You too can help us maintain the Eco Friendly methods on our Hawaiian Tours, by taking our Valley Isle Excursions Road to Hana Tour, we provide only 1 vehicle for every 12 people, this takes about 6 rent a cars off the road. That’s 6 cars using fuel, wearing out tires and producing waste oil. Did you know that for every Gallon of Gas you use, 14 gallons of air is polluted? Having six cars off the Road to Hana makes environmental sense. Let us take you on the Valley Isle Excursions Road to Hana Tour, we will teach you about the Hawaiian Culture, a Culture that Practiced environmental protection, help us keep our Island Clean and free of wasteful rubbish, help lower the polluting of our air. It is our responsibility to leave our lands and air to our Grandchildren’s Grandchildren so that our legacy may survive. All of us must take this responsibility serious and do even the smallest thing to insure the future! Why Is There An ‘I Survived The Road to Hana’ Shirt?